Nothing in space stays still. In fact, most stars are like long-distance marathon runners, as they are constantly moving in space throughout their lifetimes. However, astronomers have recently spotted a star (shown in this new space photo as a green smudge in the box) that is better at sprint running. Astronomers think the pulsar shown in this photo (shown in green in the box) is moving at an incredible speed of between 9 million and 11 million kilometres per hour! This could make it the fastest moving pulsar ever known! To work out the speed of this star, astronomers had to figure out how far it has travelled since it started its race and how long this took. Astronomers think the star began its race at the center of the purple cloud of gas and dust in the photo. That's because this is a special type of star that rotates very quickly, which is called a pulsar. 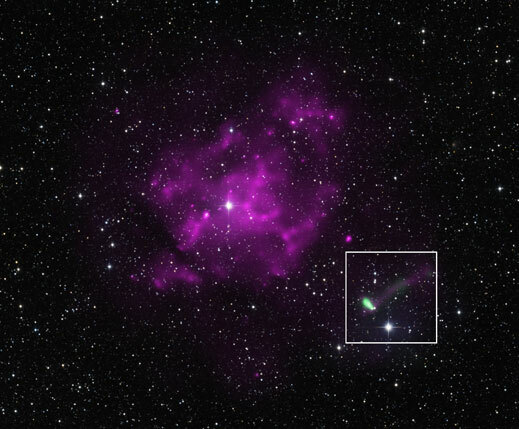 And the pulsar was ejected during the explosion that created the cloud of gas and dust. Based on their estimates, the astronomers think the pulsar is moving at an incredible speed of between 5 million and 7 million miles per hour! This could make it the fastest moving pulsar ever known! But there is a competitor for the title, as another pulsar has previously been estimated to be moving between 3 and 6 million miles per hour. It's a pity astronomers can't enter these two stars into a 'Space Olympics' to determine which one is the fastest sprinter. Instead, they need to work it out the hard way and fine-tune their results. Cool fact: If the pulsar is moving at a speed of 7 million miles per hour, it could travel around the Earth's equator in about 13 seconds!